This functionality is cool since you can use it to limit your population to folks who took some action in a specific time period and then observe their subsequent behavior across a future time period. Another example might be the desire to see purchase behavior of people in Q4 who looked at products in Q3. 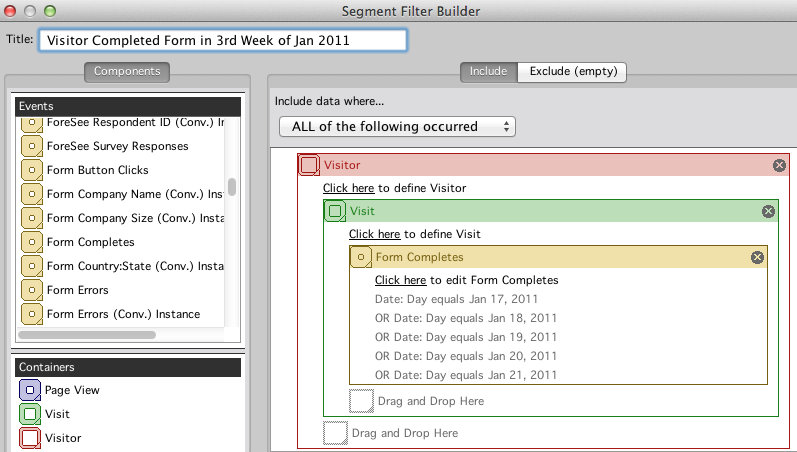 In order to build a segment that crosses multiple visits, the obvious starting point is the Visitor container within SiteCatalyst’s Segmentation tool. If you want to select a Visit in one time frame, but look at data for another time frame, you will need to use a Visitor container and nest a Visit container and/or Success Event container within it. In the preceding example, we would want to create a Visitor container, but nest a Visit container within it in which the visitor had a Visit where a Form was completed in a specific week of the month of January. Sounds easy right? Unfortunately, it isn’t as easy as you’d think, because there is no way to segment on a date or month within SiteCatalyst like you can in Discover. Therefore, the trick is to pass the date to a SiteCatalyst variable within each Visit. I suggest you add one new eVar and one new sProp and set the date on every page. In addition, you can easily create a SAINT Classification for each date which rolls these dates up into weeks, months or years as needed. If you’ve read my past blog posts, you will soon realize that this trick is similar to the Time-Parting plug-in I described years ago. In fact, it is really just a variation on that, but without the time of the day. 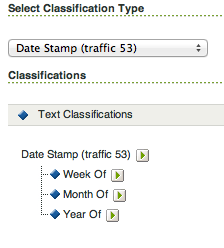 However, limiting the values to just the date makes the data much more manageable and more easily classified. The use of this, plus segmentation allows you to mimic what has been possible in Discover for a while so if you have lots of SiteCatalyst users, give this workaround a whirl…Enjoy! I have worked with two customers in the last month who do this. You’re right, it is more manageable than TimeParting. On the other hand, I spoke with a guy who tried to run a cohort analysis on “people who come to the site because they had just watched a TV advert”. He didn’t have a vanity URL, so I suggested timestamping down to the minute, but only when ads were running. Hi Adam – great post. I had a similar question a few weeks ago and didn’t know how to answer it. Once my client is on v15 this will be very useful. Thanks. Qu – rather than specifying an actual date, is there any way to segment along the lines of a rolling date range? Such as “last week”, “last month”, “between 30 and 60 days ago” etc? I don’t know of a way to do rolling date ranges outside of using this concept combined with ReportBuilder. (1) To accurately answer the question first posed in the post you will need to layer the segment on a trended report. With the segment alone you would also be including January data. By using a trended report you will be able to isolate down to the months that you are interested in and not confuse the January data with the months that have the follow-up activity you are interested. (2) The visit container in the screenshots above is unnecessary. You can put the Form Completes container right into the Visitor container. This is because the visitor has page views just as much as a visitor has visits that have page views. Having the visit container there doesn’t do any harm, however. (3) To create the actual timestamp I prefer a VISTA rule so that the timestamps match the days/hour of your report suite perfectly. If you use the timeparting plugin it pulls the time of the browser (which does have its uses if you want to match the users timezone). Keep in mind, though, that you may see some dirty data for visitor whose computer clock is not accurate or, because of timezone differences, their time doesn’t match the time of your report suite. (4) At the most granular, go down to a minute timestamp. Most likely you should just do the hour. I have seen some folks want to go down to seconds which creates too many unique values. (5) Other classifications that I have found useful are Day of Week, Hour of Day, Date, Weekday vs Weekend. The send and third are only useful/feasible if your timestamp goes down to the hour. Thanks for the additions Kevin! Brilliant Adam! I just recently started using an evar/prop for the same purpose (looking at offline metrics filtered by clickthrough date) but was hitting a wall when it came to filtering by large time periods. Tossing in week, month, and year classifications on the date stamp took this from a messy solution to a very manageable process. Thanks for the insight.